The Royal Navy's new £3bn aircraft carrier is unable to leave port because of bad weather and ongoing engineering work, its operator has said. 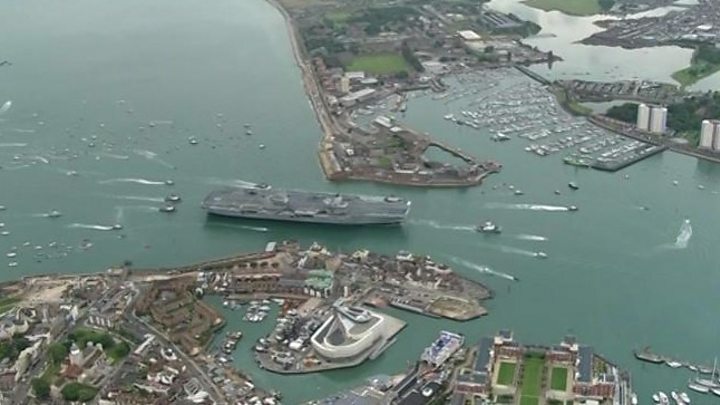 HMS Queen Elizabeth is due to sail from Portsmouth soon for a second series of sea trials. The Aircraft Carrier Alliance (ACA), which operates the 65,000-tonne ship, said it would leave port when weather conditions and other factors allowed. It said: "We plan to sail later this week when we can ensure a safe exit." On Monday, Defence Minister Harriett Baldwin said the carrier was due to begin trials this week, "weather permitting". The ship failed to take up a provisional departure slot from Portsmouth on Tuesday. An ACA spokeswoman said: "We're not yet ready to sail. "A number of factors will determine when we sail, including the weather conditions in Portsmouth and engineering work which is coming to an end." The former First Sea Lord, Admiral Lord West, said the carrier would always be available in a crisis, but it would be "stupid" to conduct sea trials when the weather was "iffy". He said: "When you have to sail because it's operational, and you scrape something on the way out, that's just the way it goes." The 900ft (280m) carrier arrived at her home port in August after leaving Rosyth dockyard in Fife, where it was built, in June. Ms Baldwin said it "remained on track to be accepted into the Royal Navy this year". A fresh to strong breeze with gusts of up to 37 knots (43mph) was forecast in the Solent for Tuesday, according to the BBC coastal weather bulletin. The sea state was described as "moderate" while visibility was "very good becoming excellent".